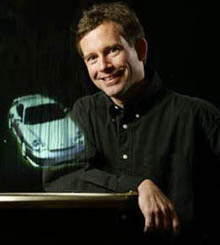 Update Aug-18-2005: According to the company's press release, the Heliodisplay is now available for purchase. Heliodisplays are available in projecting image sizes from 22 to 42 inches (diagonal), and is available with interactive features. IO2 Technology's website (http://www.io2technology.com), which has Heliodisplay(TM) units available for direct purchase, demonstrates how a user can move the image of a watch in mid-air with their finger. I saw this device demonstrated at Wired NextFest, a technology exposition in Chicago earlier this summer, and it really works - it's an impressive device. In his Dune novels, Frank Herbert makes use of something he calls a "solido projector" - a device that forms an image directly on a conference table. Films like Star Wars show how images projected into the air might be used. 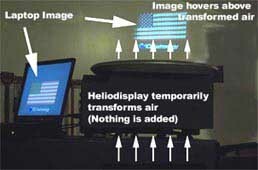 The Heliodisplay from IO2Technology projects images - both still pictures and video - into mid-air. It works with most video sources. It is also interactive, forming a floating touch screen that can be manipulated with your hands. As shown in the diagram below, air flows into the device, is modified and then ejected and illuminated to produce the image. Nothing is added to the air; nothing affects air quality. Images can be seen up to 75 degrees off aspect, similar to an LCD screen; no special glasses or projection screens are required. The image is two-dimensional, not volumetric. The science fiction film Star Wars has several famous examples of how a projection device like this might be used. 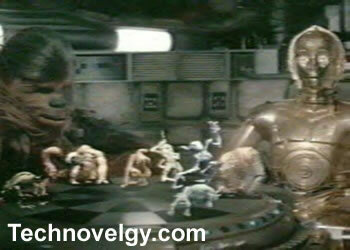 For example, in the scene below, R2D2 and Chewbacca are playing a board game with projected pieces. And of course we all remember this scene. Advertising and Promotion, e.g. : trade shows; in-store displays; museum, movie and casino displays; theme parks. Collaborative Decision Making, e.g. : board meetings and presentations; air-traffic control; military command and control; architectural and engineering design; teleconferencing. Simulation & Training, e.g. : virtual targets; pre-operative planning; virtual surgery. Consumer, e.g. : video games; home theatre. Heads-up displays in new fields, e.g. : a patient's vital signs could hover above the chest during open heart surgery. Build one into a door jamb and have a walk through image or virtual privacy screen. An in-store end cap advertising display and demonstration through which the customer can reach and grab shown product. Build the Heliodisplay into furniture, e.g. project from desk. Be sure to take a look at a device that uses a different technology to make a similar kind of presentation - the Toshiba 3D Flatbed Display. The science fiction examples mentioned above cover several of these proposed uses of the Heliodisplay; are there any other uses already imagined in sf?